To me, it unlikely to get the maturity sum of 16,075 which translate to a 4.1% return per annum. You will be lucky if you get 3% or about 14,142. From the BI, at end of each year, your cash value is less than the accumulated premium paid and you will lose if you surrender before end of 10 years without taking into account interest loss. 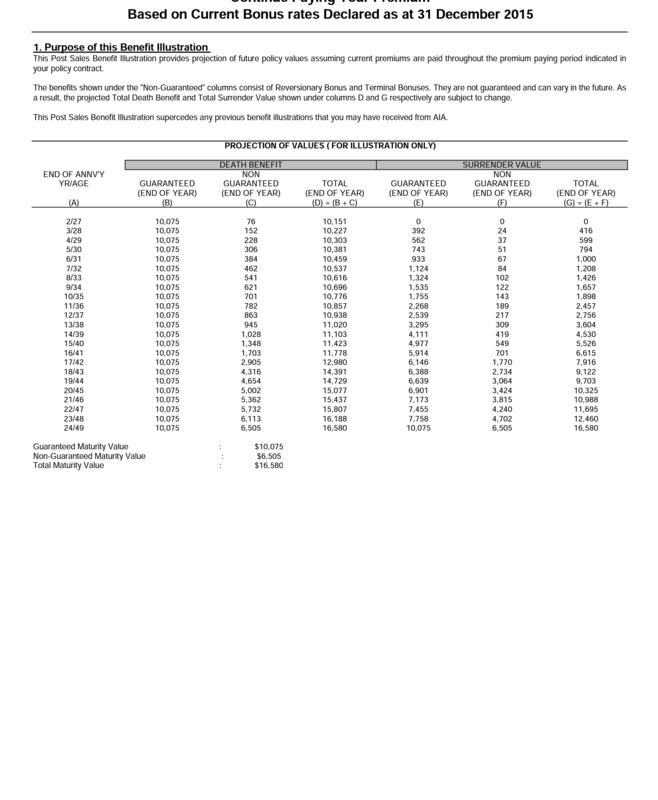 If the declared bonus is less than projected, the breakeven point may be 13 or more years. The NG value is the bonus that it will declare at the end of each year and accumulate. 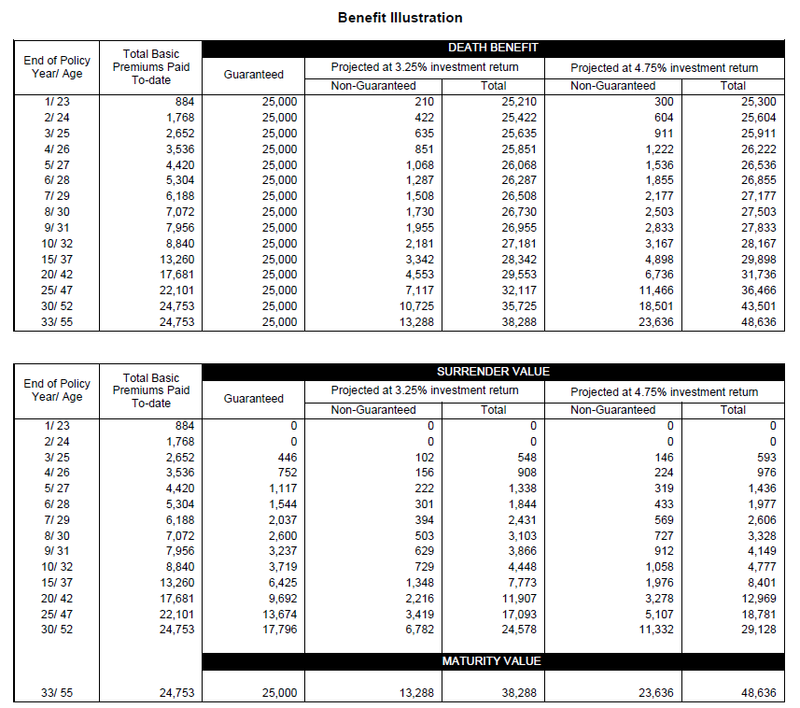 So at each point you look at the guaranteed amount plus the accumulated bonus that has been declared to get your cash value. 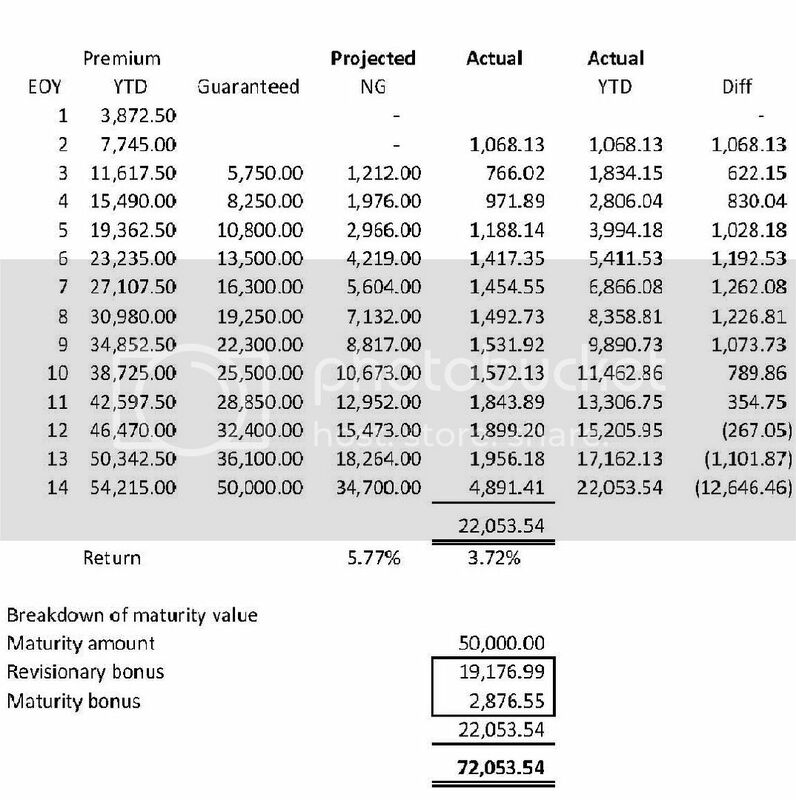 Since you are half way through, say end of 10 year, look out for the accumulated bonus that has been declared and compare to the projected NG value and you will have a rough idea whether you will get the projected NG value of 6,075. Quite certainly, it's less. Please let us know the numbers. every year there is this bonus that will be declared by NTUC income, which makes up the NG portion, and will accumulate, so am i right to say the bonus every year will fluctuate and won't be consistent, like 3%/annum? my policy is currently still under my father's account, just checked my ntuc income account. will give a ring to ntuc income tmr regarding the transfer if it's possible directly. will update you guys as soon as i get the numbers! You can log in ntuc online to check your acct. Yup whole life have non guranteed portions too so the figures will change. noted. so i believe i should be able to retrieve the latest BIs for all my policies via my ntuc income account online right? or will ntuc income send me the latest policies via mail? sorry if i'm asking all these questions..
My endowment policy that matured in 2011. Non-guaranteed (5.77%) vs Actual (3.72%). Illustrated to make you stick to the end? understood. may i know how should i go about getting the latest BI? calling up ntuc and asking them to send it to me? while i'm on this, i have 2 whole life policies with ntuc income also; will life policies also have changes to its BI? You can just email them. They will respond within 3 days. That's 36.44% off. They screwed the last year. Camping for insurance agents to justify their comms now!!! Phrases like 'forced savings', 'at least you didn't lose money', 'be happy that u made a gain' coming out? Last edited by bibu00; 30-08-2016 at 09:13 AM..
Witwit84 and mrclubbie like this.